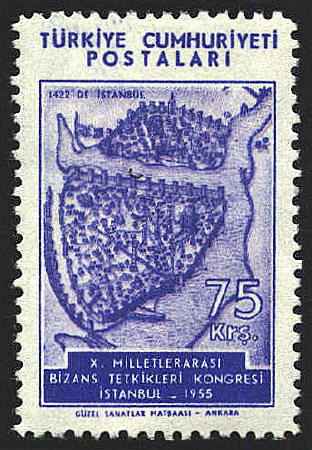 This stamp depicts a view of Constantinople as it was about thirty years before the Turkish conquest in 1453. The map-maker, Christoforo Buondelmonte was a highly cultured descendent of a great Florentine family. Early in the fifteenth century he sailed to Rhodes and spent the next fourteen years searching for ancient Greek manuscripts. His book, Liber insularum Archipelagi was dedicated to Cardinal Giordano Orsini; the initial letters of the eighty-two chapters of the book spell out Christofus Bondelmonti de Florencia. Presbiter, nunc misit Cardinal Iordano de Ursinio. MCCCXX. Included in the book are nautical instructions, "tourist" information on the Cyclades and the Ionian Islands, as well as maps of coasts and cities, among which is the view upon which the stamp is based. 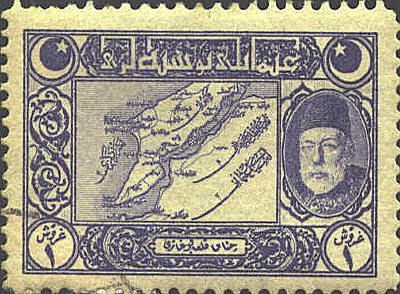 The Turkish stamp shows a portrait of Mohammed V with a map of the Dardanelles between the Gallipoli peninsula in Europe and Anatolia in Asia Minor. Also seen on the map are the trench lines of the Turkish military in its struggle with the British.